World-leading blended Scotch whisky Johnnie Walker has introduced a new, limited-edition duty-free exclusive: Johnnie Walker Black Label Triple Cask Edition. The whisky, available now and priced at £28 for a one-litre bottle, was developed by Johnnie Walker master blender Jim Beveridge and blender Chris Clark. Described as ‘rich, sweet and spicy’, it is based on a mix of malt and grain whiskies, including Cardhu and Cameronbridge, and was finished in casks previously used to mature Bourbon, then Scotch whisky and finally Caribbean pot still rum. 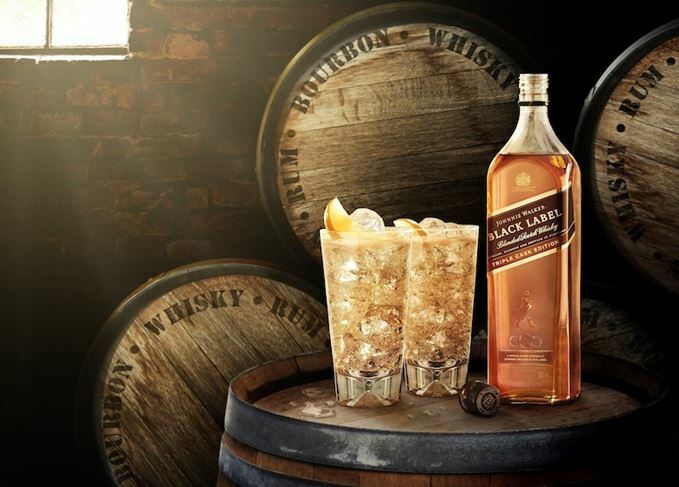 Johnnie Walker Black Label Triple Cask Edition is said to be ‘a wonderfully rich Scotch with layers of sweet vanilla and ginger aromas, with notes of exotic fruit and brown sugars’. The suggested serve for the whisky is the Johnnie Walker Black Label Triple Cask Coconut Spritz, combining Triple Cask with coconut water, soda water and sugar syrup, and garnished with lime zest and a mint sprig. The whisky is available exclusively from more than 300 duty free stores operated by Dufry, the world’s leading travel retail company.